King's Road #3 Review – AiPT! The evil Malicia and her army has cornered Donal Garrett and his family. All there is left to do is fight. Is it good? 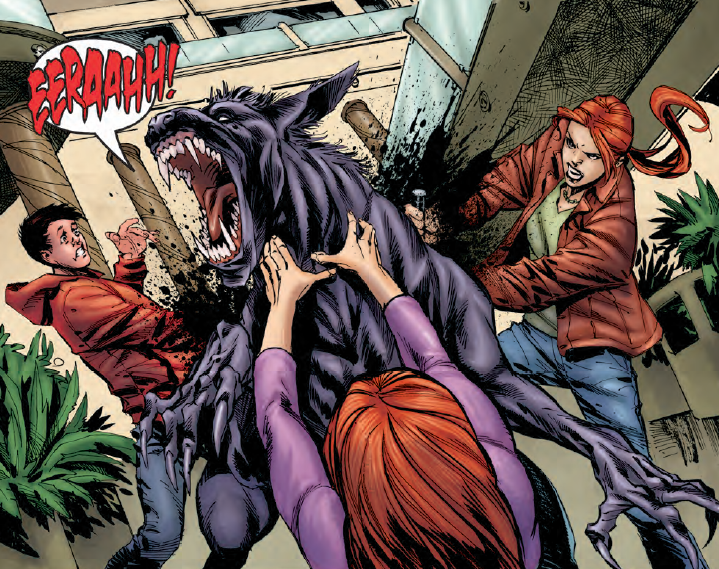 King’s Road #3 closes out the opening arc to the series by Peter Hogan and Phil Winslade. The issue centers around a battle between the sorceress, Malicia, and Donal Garrett. From the opening pages, the problems with King’s Road are readily apparent. Peter Hogan’s characters here lack any real depth or motivation beyond a generic good vs. evil power struggle and the focus on the action prevents them from getting it in this issue. The dialogue lacks any real punch, there’s no humor to grab on to. In fact, nothing memorable gets said until the final page of the issue, and so readers will likely focus on the illustration, which fares a bit better. Staz Johnson keeps the action at the forefront with his artwork. Johnson’s detailed line work makes sure that every collision in the combat has real weight and impact and colorist Douglas Sirois utilizes blood spatters to good effect. Unfortunately, the other aspects of the art don’t pay off. Sirois utilizes a more realistic palette, which would work wonders in a horror or drama. But here, it only exacerbates the problems with the characters; the muted palette leaves the dull characters to fend for themselves. The design work on Malicia feels like a rip-off of Marvel’s Morgan Le Fay. Unintentional or not, it’s an uninspired look and feels like it exists solely to titillate the audience. Her horde of demons are equally bland. The lack of inventiveness in the looks of the villains actually plays against main strength of King’s Road #3, which is the action. There are no real surprises here, no unique action beats that stand out. Peter Hogan and Staz Johnson have the battle take place within a mall, but never take advantage of some of of the fun that location could have provided. It ultimately becomes repetitive until the book reaches its predictable climax. King’s Road feels like a callback to older monsters-and-babes stories, but it never quite does enough to make the return visit worthwhile. There’s strong artwork on display in King’s Road #3, but it feels wasted on underwritten heroes and generic foes. Ultimately, King’s Road #3 is too mired in genre conventions to be compelling. Lovers of the fantasy genre would be better off looking elsewhere for entertainment.